[QODBC Online] Troubleshooting - Getting Error There was an error while communicating with the Ids Server. Troubleshooting - Getting Error There was an error while communicating with the Ids Server. I am on Windows Server 2008 SP2 32-bit and try to connect QuickBooks Online using QODBC Online. I am using QODBC Online Version 18.0.0.325. I have authorized QODBC Online at QuickBooks Online. I am getting below error on connection. QB Begin Session Failed. 653 - There was an error while communicating with the Ids Server. - - The Response Stream was null or empty. Usually, this error text means, Intuit API server is not reachable or is not responding. The issue is related to .Net Framework 4.6.1 compatibility with Windows Server 2008. Windows Server 2008 SP2 - does support .Net Framework 4.6 but not .Net Framework 4.6.1. On Windows Server 2008 SP2 - the Microsoft's .NET framework 4.6.1 installer did not complain and installed with no error. (Ideally, Microsoft installer should not allow installing .net framework 4.6.1). Please refer Microsoft.NET Framework system requirements for more details. QODBC Online using Intuit QuickBooks Online .NET SDK for communicating with QuickBooks Online. 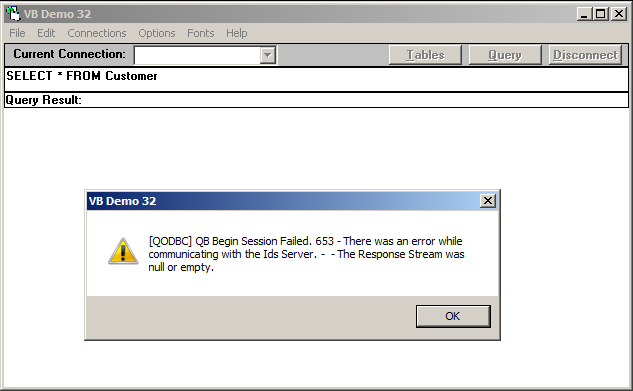 When using QODBC Online v325 on Windows Server 2008 SP2, Intuit IPP .NET SDK throws mentioned error. The error does not provide any information about the issue. I think the same will happen with Windows Vista SP2 because it allows .NET framework 4.6 (.NET framework 4.6.1 is not supported). So, you need to use QODBC Online on Windows Server 2008 R2 or above.